Katlyn Graham: Hello, I’m Katlyn Graham here with Gardner Sisk, the President of Gardner Mattress. Welcome, Gardner. Gardner Sisk: Thank you, Katlyn. Katlyn: Thanks for joining us today. We’re discussing the history of your company, Gardner Mattress today. Now, you are very familiar with this long history. Who started Gardner Mattress? Gardner: Gardner Mattress was founded by my grandfather, Alan Gardner, in 1933, during the first depression. Originally, he worked for Mr. Cohen, who ran the Salem Mattress Company. Then, three years into his own business, Salem Mattress folded, and became the Gardner Mattress Corporation. He used the money from my grandmother’s dowry to buy one of the buildings that we’re still in today. Kaitlyn: What building is that? Gardner: 254 Canal Street. This was a warehouse for a traveling fair called the Reed Fair, where they pulled guiding up at the back of the factory, loaded everything on, and then they went to their different stops, like the different carnivals that you see today that come to the small towns. Kaitlyn: That’s still where you’re manufacturing today. Kaitlyn: What distinguished Gardner Mattress early on? How were they able to beat out the Salem Mattress Company? Gardner: Basically Al built a superior product. He developed a name for himself as having great value in what he did. It was a onetime markup. That was the thing he always stressed, was he was the only person. There was never a between man. There was never somebody else getting a piece of the action. You were dealing directly with Al. He always made a much better product at a very competitive price. Katlyn: That really made him stand out. Katlyn: How has the business changed over the decades? Gardner: The basic premise hasn’t changed much. We’re still terrific value, but now we do a lot of direct sales to customers, what you would call probably retail, through our own outlets. We sell all our own bedding. We rarely private label anything anymore a little bit, but not too much. Everything we make is custom-made for every customer. We sell it directly. You pick out what you want. If we have to tweak it a little bit, we do. Then we deliver it in all our own trucks. Katlyn: I should have asked first. How did you get involved in the business? Gardner: I really had no intention of being involved in the bedding business. I was all set to take a job with a friend out on the West Coast. He got hurt. My grandfather was hospitalized at the time. He was a little sick. He said, “If you’ll help me out for a year, I’ll make it worth your while,” that was in 1972. I worked for him for a year. Then, three years later, we figured out a pension plan where I bought the business from him. Katlyn: The family traditional continues. Gardner: Yes, it does. I’m here with my son, Kirk. The two of us have had a great working relationship for quite a while now. I think he was telling me yesterday, 27, 28 years, you’ve been with us. I’ve never realized it was that long. It’s been fun. Katlyn: A lot of your family continues to work there today. Gardner: Yes, we do. I have Court, and possibly, eventually, Sarah. Everybody really enjoys what we do, and appreciates how good the article is that we manufacture. Katlyn: Yes, I’ve heard how impressive this is. Now, I’m just looking at your mission statement. I’ll just read it out loud to you. Quite a mission statement. What stands out to me right there is just how you are actually concerned about health and improving people’s lives with these quality mattresses. Gardner: That’s true. A lot of it is the materials that we use. 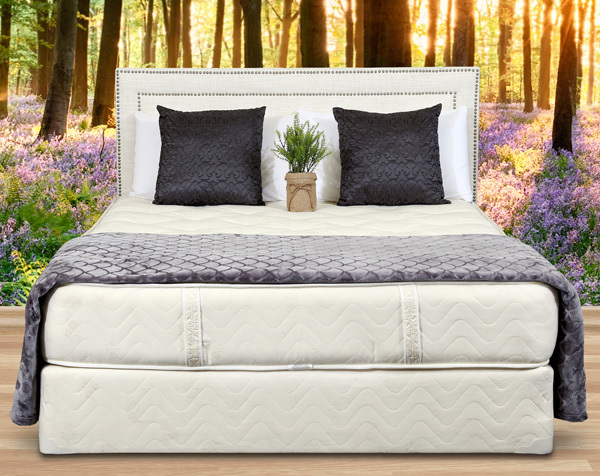 Commercially, they can’t afford to use the high quality materials that we do which make the mattresses, not only wear better, but they also make them a lot healthier to sleep on. You’re not going to have any issues with allergies on our bedding. You’re not going to have any issues with any of the chemical sensitivities that you see people having in this day and age. Our bedding is naturally made that way. We don’t have to work at it. It’s just the components that we use, very high quality. Katlyn: Very high quality for decades in Salem. Thank you so much for explaining that, Gardner. I really appreciate it.